You can choose between our six apartments among the holiday home. Each one is different in its decoration, size, number of beds and location within the house. 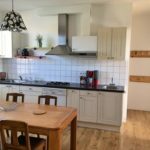 ⁃ a fully equipped kitchen with a dishwasher, hotplates, a microwave, a fridge, a kettle, a coffee maker and a toaster. Please find below the list of the different apartments. You can click on the link to discover the accommodation and its features. Do not hesitate to contact us if you have any questions, it will be our pleasure to answer them.